Because Thanksgiving is about celebrating, food, and recognizing what we’re grateful for, I thought I’d talk about all three today. 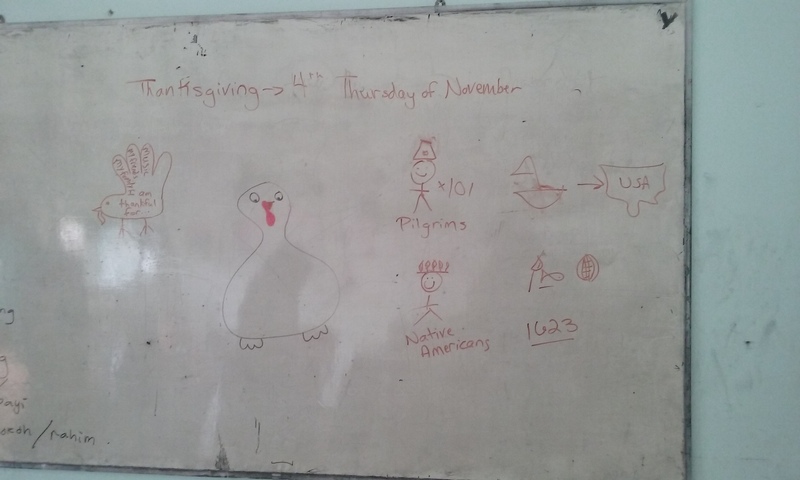 I wasn’t able to incorporate Thanksgiving into my regular lessons because we were prepping for the end of the semester exams, but I was able to have some Thanksgiving fun in English club. First I gave a brief rundown of what Thanksgiving is. Fourth Thursday of November. Settlers came over on a boat for religious freedom. They couldn’t feed themselves. Native Americans helped them not die. In 1623 they celebrated together. Today it’s all about feasting, family, and giving thanks. Cue lots of food pics—turkey, mashed potatoes, sweet potatoes (with marshmallows), turnips (for my grandfather), stuffing, gravy, corn, cranberry sauce, pumpkin pie, apple pie. The works. Then more pictures of turkeys. Then I handed everyone a piece of orange cardstock and we traced our non-dominant hand and turned it into a turkey. We decorated with markers, crayons, and colored pencils. 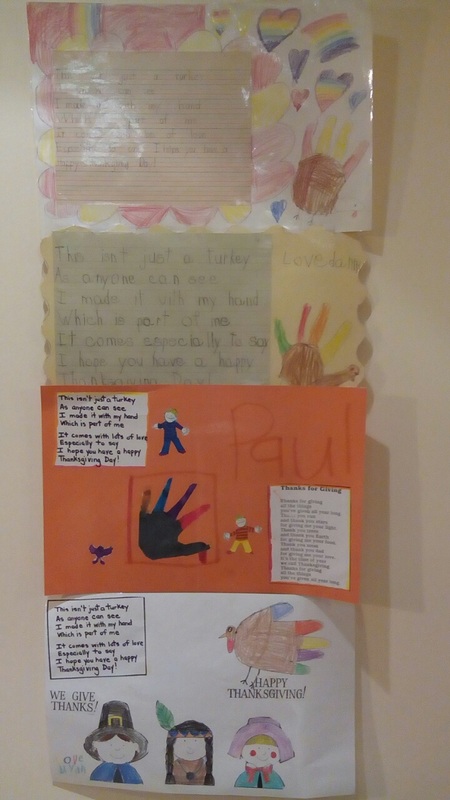 Thank you to Mrs. Brockman, my first grade teacher (who also taught my three siblings), for having us all make these turkeys. And thank you to my mother for laminating them and hanging them in the kitchen each November. 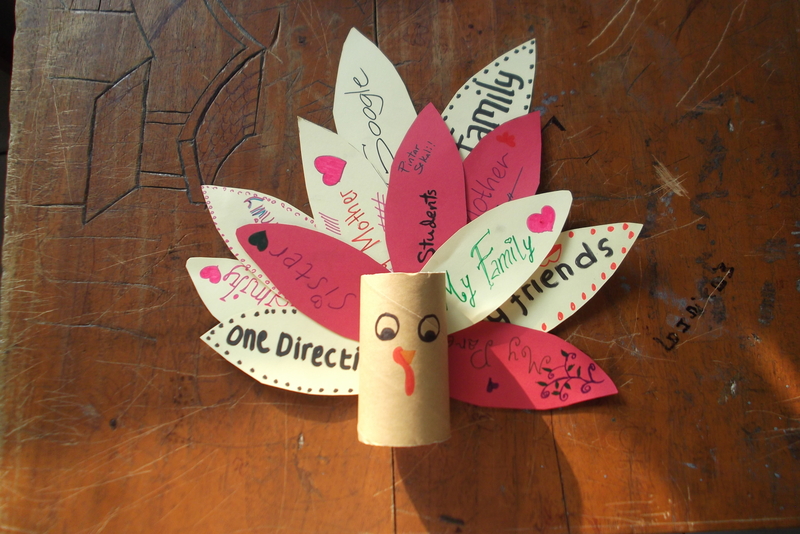 In the palm of the turkey we wrote “I am thankful for…” and each turkey feather had something we’re grateful for. Then I gave everyone a paper feather. We wrote one of the things we’re thankful for on it. Then we played pin the feather on the turkey. Final results of pin the feather on the turkey! Finally, I took all the feathers off the white board and put them on a toilet paper roll turkey. Fun was had by all and the turkey now sits proudly on my desk. And now for some info on food in Indonesia: where I get it and what it is. I do the vast majority of my grocery shopping at one of the dozen local Indomarets as well as Alfamart (small convenience-type stores that carry eggs, instant noodles, and bread). But I always buy my laundry detergent and Oreos from the corner store near me because I like talking with the employees. Bu Mul has taught me how to cook some dishes and sometimes will cook meals for the two of us. Which is always great. Other times I’ll buy food from nearby warungs (street food stalls). My favorite lunch spot sells lotek (a salad-like dish) and dawet (an extremely sweet drink with lots of gelatinous mystery chunks that are very popular here). Not a huge fan of the drink, but love lotek and love Bu Sri, the woman who runs the stand. Though now her daughter has taken over. Also, there’s a tree growing through the middle of the stand. Which is pretty awesome. The lotek near my school and home! Bu Sri is on the right, and her daughter on the left. I got my lunch “di bungkus” which means to go. The plastic bag is dawet and the usual way of serving drinks on the go (not cups). The newspaper holds delicious lotek inside. My favorite dinner spot is just outside my neighborhood and sells nasi goreng (fried rice), bakmi jawa (Javanese fried noodles), bakmi godong (Javanese noodles in a soup), magelangan (fried rice mixed with fried noodles), and rica-rica (???). My favorite is hands down nasi goreng, which has some eggs, some chicken, some vegetables, and lots of deliciousness. It also comes with cabe (chilis) and acar (very lightly pickled cucumbers). I put the acar on top and eat it with the chilis on the side—taking a bite of chili then a bite of nasi. The cucumbers help cool my mouth down after the chili. And literally right now I just realized that for the first time ever the phrase “cool as a cucumber” makes sense to me. Nasi G unwrapped. Nibble a chili then take a spoonful of NG! There’s an area to the right of the sign to sit down and eat. There are both tables with chairs and tables close to the ground to eat on the floor. I like the second better! And below are some pictures of the infamous “boxes” that are everywhere here. They’re served (in either snack or meal form) at any event you could possibly think of (which is nice because, food). In addition, teachers will bring them in to spread good news and celebrate. I’ve had new baby boxes, wedding boxes, promotion boxes. Everything. It’s great. Not all boxes are created equal though. For example I struggle immensely with the fish boxes because eating an entire fish with a very tiny very flimsy plastic spoon is immensely frustrating (Alanis Morissette should have been singing “it’s like 10,000 spoons when all you need is a DAMN STURDY FORK”). But it’s the thought that counts and it’s always a fun journey opening a box and going through trying everything. Because most of the time there’s at least one mystery item in there. Pak Rifa’s “I have a new daughter!” box. It’s traditional to buy a goat and slaughter it to share with family and friends after the birth of a child. One goat for girls, two goats for boys. The box on the left was filled with pastries. The box on the right had (from the fruit going clockwise), watermelon, goat internal organs, regular goat meat, “krupo” (like chips but less salty and airier), and nasi. This one had fish, some veggies, some rice, and some krupo. There’s also an abundance of fruit. Everywhere. All kinds. Unlike money it does grow on trees. And there are fruit trees all over the place. I just recently discovered a markisa (passionfruit) vine on my sideyard. There are mangga (mango) trees across the street, and a kelengkeng (???) bush in my front yard. Bananas, dragonfruit, jackfruit, grapes, everywhere. There are generally two drinks made with fruit. One, es ______ (which means ice), is like lemonade—you squeeze the juice out and add water/sugar. The second, jus, is more of a smoothie—cut up the fruit and put it in a blender with water. Both are delicious. Jackfruits are huge and surprisingly jackfruit trees seem to be everywhere. The part you eat is hidden inside the spiky exterior. This guy runs a small shop across from MAN Wonosari. I was walking by with Bu Mul the other day and he just handed us this huge, freshly picked bunch of grapes. I had no idea there was even a grape vine there. These guys with motorbike food stands are everywhere! A typical Indonesian breakfast–a sort of warm soup with veggies and “bakso” (meatballs), fried tempe, and dried and fermented cassava. Indonesia loves drinks and does them well. This is a sweet coconutish concoction. The dark bits at the bottom are syrup. Very very sweet syrup. You stir to your liking. I usually don’t stir. “rawr es krim”– ice cream from a shop nearby me on what is essentially toast. With froot loops?! It was great. “Nasi putih” (white rice) with a type of powdered sambal (the condiment of choice, always very spicy) on top. It’s got chilis and peanuts in it and it’s like crack. On the left is a cappuccino iced drink. It has sweet cheese and chocolate bits on top. That’s some of the only cheese I’ve seen here…. Around Halloween I mentioned pumpkins being big and one of the teachers came in the next day with homemade pumpkin pudding cups! It was delicious and made me think of home. Pumpkin spice for life. My family and friends. Talking to you—in whatever form our “talking” takes—helps me stay positive when times get rough and Indonesia seems to be swallowing me whole. Bu Mul and Pak Rifa. These two people have accepted me into their homes and hearts and are now family. Teachers. They matter. So much. Students. They also matter. So much. And mine are wonderful and a pleasure to teach. Music. It’s nice to hear some friendly catchy English. Or some soulful catchy English when necessary (shoutout to Adele’s 25). Books. Hours and hours of alone time after sunset at 6 means more time for reading than I’ve had in a while. It’s nice to be able to escape into a good book (shoutout to the entire Harry Potter series—pacing myself but am about to start Goblet of Fire). Air conditioning. Would be lost without you. The Indomaret convenience store that stocked Froot Loops. Thank you, Mrs. Brockman, for giving me inspiration 16 years later. Take care and have a wonderful, happy Thanksgiving filled with family and great food. About a month ago I got my first haircut (potong rambut) in Indonesia. The barbershop had one chair, one barber, and me. The haircut and a wash cost 8000 Rupiah or about $0.57. I was having a truly horrendous day filled with all of the worst “WHAT-ARE-YOU-DOING-WHY-ARE-YOU-HERE-YOU’RE-USELESS-GO-HOME” gremlins. The haircut, a simple haircut, made everything okay again. I wrote a poem at the time. Now, after a second haircut in Indonesia, I think it’s finally time to tell the world of my love for this barber (tukang cukur).